Our Open Daysails are a Great Way to Spend a Summer Afternoon in Cape Cod! Enjoy the sights of Cape Cod aboard one of our public daysails this summer! Cape Cod is a quintessentially American summer vacation destination. The weather is warm enough to remind you it’s summertime, but when the cool breeze drifts in from the Cape, it can be incredibly refreshing. When summer descends on Annapolis, the Liberté migrates north for the season. And while we are certainly well-known for our exceptional attention to detail on private charters, we also offer open daysails seven days a week, weather permitting, that can make your Cape Cod vacation truly remarkable. Because we follow the wind and tide, no two daysails are alike! Our captain always strives to make every sail, public and private, the best experience possible so you’ll always remember your trip aboard the Liberté. We give a short presentation about the history of the Liberté, Cape Cod, and the islands around the Cape, and answer any questions you may have. Once the presentation is over, we set sail for wherever the winds and tide may take us, with a cash bar available for your enjoyment. Should nature take us to the west, we’ll head in the direction of Woods Hole. During this trip, you’ll be able to see a variety of beautiful sights – the historic Nobska Lighthouse and homes around that area which you can only see from the water, as well as the wild, undeveloped greenery of the Elizabeth Islands. If the winds and tide take the boat to the south, you’ll be able to view the splendor and elegance of Martha’s Vineyard. We arrive near Oak Bluffs and Vineyard Haven, where you’ll see spectacular antique sailboats and huge summer cottages that date back to the Roaring Twenties. East of this point, you’ll also be able to see the beautiful bluffs of Falmouth Heights and the pure beaches and nature sanctuary of Waquoit Bay. Enjoy More Cape Cod Culture! The Liberté is docked in a location that is quintessentially Cape Cod, making it a great place to explore either before or after your daysail. Do some fishing with Patriot Party Boats, enjoy the best fried clams in the region at the Clam Shack, or shop for some souvenirs for your family and friends back home at the Karen Rinaldo Gallery! 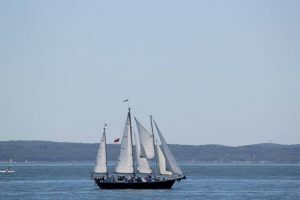 Enjoy a Lovely Summer Sail in Cape Cod with the Liberté! The Liberté provides private charters in Cape Cod and Annapolis as well as public sailings in Cape Cod. Celebrating aboard the magnificent Liberté is a great way to create cherished memories that are sure to last a lifetime. If you want to charter the Liberté for your next corporate event or wedding reception, contact the Liberté today! Call us today and we will be sure to respond within 24 hours. Be sure to also check us out on Facebook, Google +, and Twitter. This entry was posted on Friday, May 18th, 2018 at 11:01 am. Both comments and pings are currently closed.